Rev. 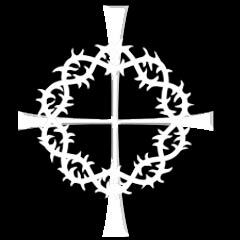 Edward T. O’Neill, CSV, died Thursday, August 21, 1975 at Holy Family Hospital in Des Plaines, IL after a short illness. Father O’Neill was 68. He was in the 44th year of his religious life and the 21st year of his priesthood. Fr. O’Neill was born on April 13, 1907, in Chicago, the son of John O’Neill and Lucy Edwards O’Neill. He received his secondary and college education at St. Viator Academy and College in Bourbonnais, IL. He graduated in 1929 with the degree of Bachelor of Arts. In 1930, he joined the Clerics of St. Viator and was professed in 1931. 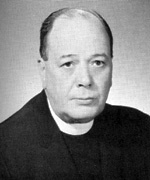 He received his seminary training at Catholic University of America in Washington DC, and was ordained by Bishop James Griffin, DD, in Springfield, IL in 1934. Fr. O’Neill did graduate studies in English at Catholic University of America in Washington DC and DePaul University in Chicago. After ordination, Fr. O’Neill taught successively at Cathedral Boys’ High School in Springfield, IL; St. Patrick Central High School in Kankakee, IL; and St. Philips High School in Chicago. He served with distinction, as a military chaplain in the United States Army from 1942 to 1946, seeing service both in this country and in Europe. In addition to many citations, he received the Purple Heart. After his return from service, Fr. O’Neill taught at Mundelein College, and then at Loyola University, both in Chicago. From 1958 to l96l, Fr. 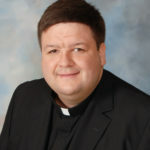 O’Neill served successively as Associate Pastor of St. Patrick’s Church in Kankakee, IL and as Chaplain of the Municipal T. B. Sanitarium in Chicago. From 1961 to 1967, he returned to teaching to head the English Department at St. Viator High School in Arlington Heights, IL. In 1967, he was appointed Treasurer of the Viatorian Residence located at 6205 North Sheridan Road in Chicago. Fr. O’Neill retired in 1969 due to declining health and for most of the years of his retirement resided at the Province Center in Arlington Heights, IL. Fr. O’Neill was well known for his excellent teaching abilities, and was deeply appreciated by his students for his thoroughness. He is survived by his brother, Albert. The wake service was held at Theis Funeral Home in Chicago on Sunday, Aug. 24, 1975 at 8:00 p.m. The funeral was celebrated at St. Viator Parish in Chicago on Monday, Aug. 25, 1975 at 11:00 a.m.
Burial was at Queen of Heaven Cemetery in Hillside, IL. Please remember Father O’Neill in your Masses and prayers.